apparently i’m on a pizza kick! tonight is a friend’s birthday. i was tagged with bringing the oh-so-delicious vegetable pizza. it’s not one of those cheesy pizza. no, no. it’s great for small bites especially when the weather turns warm. i normally use the garden vegetable cream cheese and a medley of red peppers, carrots and broccoli. on a non greased cookie sheet, unroll the crescent roll package. form a rectangular crust. bake according to the package, normally 11-13 minutes or until brown. while the crust is baking, chop up your veggies into bite sized bits, or smaller. 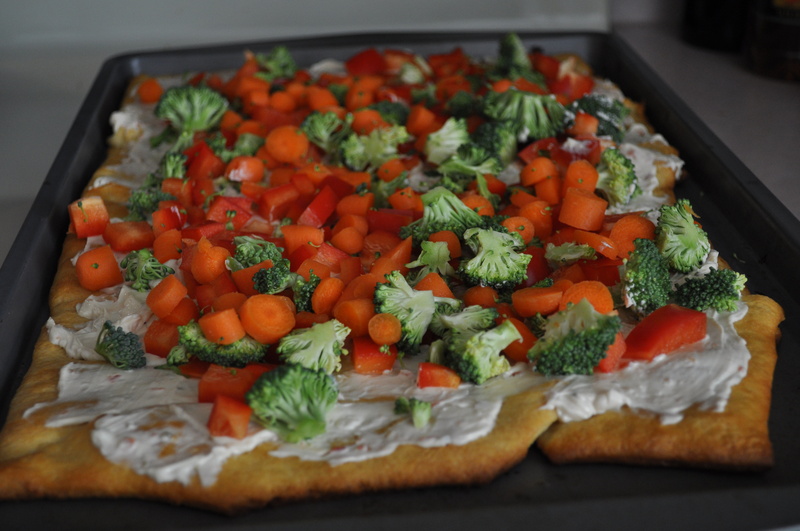 when the crust has cooled, smear the cream cheese up to the edges and sprinkle the veggies around the pizza. cut into small squares and put in the refrigerator so it can get nice and cold. it is best to serve this chilled. What’s on the menu tonight? I was poking around online and found “Penne Premavera” from a favorite site of mine, Poor Girl Eats Well. I took my own approach to this recipe but stuck to the meat of it. *i have the Le Gourmet Chef Rosa Maria seasoning for oil dipping that I use in almost anything when I season. I used about a generous tablespoon in this dish. It’s amazing. So I threw the butter into a pan on medium until melted. I added the garlic, onions and carrots until the onions started to soften. I then added the broccoli and cauliflower until they were soft. I then added themushrooms, tomato, wine, milk and seasonings until everything was warm. 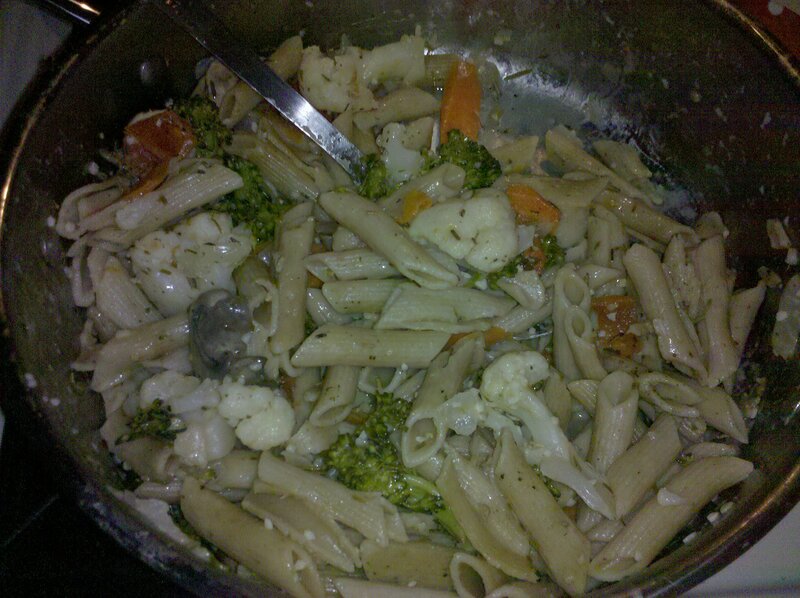 I then tossed in the penne and mixed it around to soak up the wine and let it simmer for about 10 minutes on low. Season to your own liking if needed and top with “shakey cheese”.